Epic anime worth the watch! This was probably my favorite thing to ever come out of Toonami back in the day besides Read or Die the movie and Outlaw Star. This is such a nostalgia trip and an awesome action anime. Definitely worth the watch if you have time. It might not stand up to some more recent stuff but this was dark, gritty, and all around amazing when I was a kid. The story was very engaging and the world building was great. The pacing in each episode I thought was really good as well and they did a fantastic job of making you want to watch the next episode. I would suggest marathoning this. The music is nice and fitting for the show. It is nothing that stands out enormously but the end theme on the second episode is the most memorable to me. The overall animation is decent and smooth Maybe a little too much motion blur during the quick action scenes but it is constant enough that it can pass off as a stylistic choice. The studio did a decent job composting the 3D and classical animation so it didn't feel too jarring. Although the promo image had me worried at first that it was all going to me 3D, thankfully it was a mix. I enjoyed the diversity in characters, for a multinational team they actually had a multinational team. The background cast didn't get much development but there were so many of them and they didn't really need it and sticking to basic personalities at least gave them a believable existence. The main characters and the supporting characters unfortunately also didn't get much development much to my disappointment. Hayami had a bit of development but Kino was kind of static, boring, and at no point did I really identify with her. I can forgive most of the faults in the characters due to the complexity of the story and that this wasn't so much about the characters but about the concept of the story... at least that is how I saw the show. What really bugs me and I can't stop thinking about it is why is everyone trusting and following Hayami so blindly it's like everyone read the script and knows he's the main character so what he says goes. Overall I would and likely will watch this show again because I think on the second watch I will see things that I missed in the grand scheme of the plot. I would suggest watching it cause it's short and sweet, had a good interesting plot, a few interesting creatures, and makes your brain tickle a bit. This OVA series was fantastic. Although only four 28 minute episodes, this series felt like a full 13 episode series. The story was simple and very moving. As most war stories go, both sides have a story, and these four episodes tell both sides very well. Definitely a good watch, and worth every minute. The short and to the point version: An interesting water world take with a war between humans and an other race with appeal for (well i am not sure who would be an ideal audience for this one.). I found it to be thoroughly enjoyable and believe most people would like it but i am not really sure how to recommend the anime. I was first introduced to this anime during the glorious days of Toonami. After nearly ten years I found it here! This needs to be watched with full attention or the viewers may get lost and lose important info. It's themes are more mature than, i feel, the Toonami audience procured. 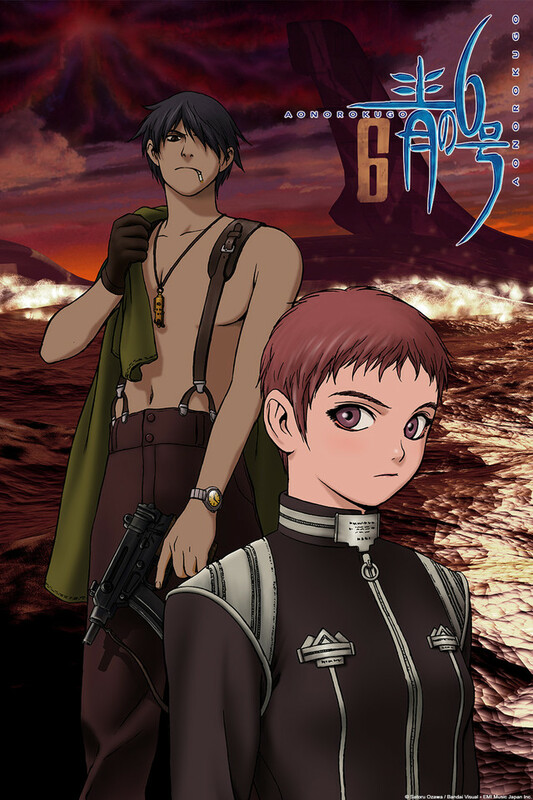 Original came across Blue Submarine No.6 back when it came on Toonami. The trailer that was shown on Toonami was pretty neat, so I decided to give it a watch. Wasn't too fond of the plot, but I was definitely digging the action and animation. Not an excellent anime, but worth keeping! Growing up, the only anime I watched were shows like Pokémon and Naruto, so I can say I viewed this without the Toonami nostalgia goggles on. And I've got to say, it's pretty good. The characters are engaging, even the ones we aren't meant to connect with at first and the ones with no dialogue at all, the setting is relatively original, and the overall plot is satisfying. ...Except for the CGI. I get that this is an older show, but, man, there is some bad CGI here. I've seen PlayStation cutscenes that look better. It's so bad it's distracting until your eyes finally adjust to it. And it's everywhere. It's not like there's just little bits sprinkled here and there- every ship, every giant whale, even the ocean itself is computer-generated. If you're in the mood for a dark, apocalyptic story with themes of tolerance and the importance of the balance of nature, and you aren't too picky about how it looks, this is a nice, short, show. If you're someone that can't stand CGI in anime by today's standards, I don't know if you'll be able to stomach it. I did, and found the overall experience enjoyable, but to each his own. One of the greatest anime ever! This is definitely one of from favorite animes. Ahead of its time for combining CGI and traditional animation, it tells a story for a dystopia future that is flooded by a mad man and his creations. Blue submarine no. 6 embark on a mission to end the conflict once and for all. I enjoyed the character development, mechanical desgins and the amazing soundtrack. Highly recommended for any fans of anime! Although many "younger" people might not like it since there are newer and fancier stories now, but this was/is one of the best short animes that I've watched. The story is great and as always there is some philosophical points of view to consider. Great anime, I would recommend to all who are looking for something good and different to wathc.